We are an international, Christian free church. Our doors are open for people from all the world, men or women, young or old, black or white, rich or poor, strong or weak. Your background and culture should not be a hindrance for your visit. A vision for this church is, as far as possible, to integrate every born again believer, rather than segregating and making national, cultural or racial churches. We have been able to profit and learn enormously much from all the different believers we have had in the church during many years. In our meetings, we sing, make music, read from the Bible, pray to the living God and speak about Jesus Christ. We know He is the answer to each person's deepest needs. We daily see His power and miracles in the lives and circumstances of people! One image of the church that probably is valid for the NCF is the picture of a hospital. Jesus did not come for the selfrighteous, seemingly perfect people, He came for the needy ones, those with problems, those who are hungry and not satisfied with what this world can offer. He came to change, restore, heal, give life and show what true love is. Our wish is that the NCF church will be the place where people can experience those things. And even more, that the "patients" within a short time will be able to take over tasks as "nurses", "doctors" etc. A vision for the NCF, is that the people who join will be trained to take responsibility and themselves be able to give something. God's Word says that when we meet, everyone should be involved (1Cor.14:26). Giving is a very important part of the Christian life. Not just finances can be given, but often more important: our time, our effort, our talents, our will, our love, our strength - our life. It can also cause the giving up of things that we have: pride, comfort, own ideas etc. The Bible tells us that the one who doesn't give will not receive. The one who invests in the Kingdom of God will receive a great reward, even starting in this present age. Our services are usually "messier" and louder than what "normal" church-visitors are used to. 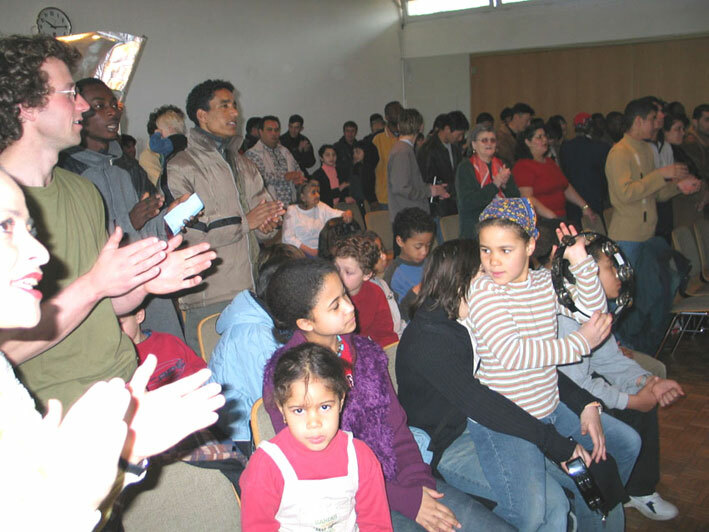 Usually we have many children around, a lot of different nationalities represented (sometimes more than 20), people translating in different corners and often people in the meetings who never set their foot in a church before. But we love it! Our God is not a stiff religious person. He has created us all so wonderfully different and special. His creation is full of colors, sounds, life and action. But we don't worship the creation, we worship the Creator. We don't "praise the bread but the baker". God did not create us to have boring miserable lives. He created us "for His pleasure", but also that we should have fulfilled lives. The word "joy" is mentioned 218 times in the Bible. Jesus wants to give us joy (Joh.15:11). And to be a Christian is wonderful! It's exciting! It's great! To be lead by God's Spirit is uncomparable! The New Covenant Fellowship (or New Testament Church in German) does not claim to be better than other free bible believing churches. But we believe we have got a place and a task from God in this area, at exactly this time. However, we also want to be aware of our roots back in history. We consider ourselves as a leaf, attached to the branches of God's revived church, stretching through the reformers back over the martures of the middle age, leading to the church fathers and to the apostles of Christ. Finally, the branch is attached to God's own olive tree, the people of Israel, with the roots far back in the old testament. God has with His love brought us together, to serve one another and people in need. This church must never become a monument of how God once did something. God's church is a living organism. As long as the love of God, the Spirit of God and the Word of God are active in the church, the gates of hell will not stop us. But if the life and the fire once would disappear, this church should rather close down (Matt.8:22, Rev.2:5). We seek and have good fellowship with many other Bible believing churches in the region and world wide. Unity is important, but we don't want "fellowship on the cost of the truth". 1 Joh.1:7 says that true fellowship comes by walking in the light, not the other way around. We consider the NCF church as one part of God's great universal church. The church that consists of all kinds of people who by grace, through faith in Jesus Christ, have been washed clean from their sins. That kind of membership is not made by man or written on paper. It's a miracle that God performs with the power of His Holy Spirit. The Holy Spirit also gives a confirmation of this miracle in the heart of the believer (Eph.1:13-14, 4:30, 2Cor.1:22). A very important goal for this church is to always put Jesus Christ and his Word in the centre. He is the way, the truth and the life. The whole Bible is pointing to Jesus, from the first page to the last. If we don't stay with Him, we will automatically go wrong. That is why we in all our services try to give a moment time to explain the simple gospel, the core of the Christian faith. To be a Christian is not complicated, even a child can understand it (in fact everyone has to enter the Kingdom of God with a child's faith: Luk.18:17). What everything circles around is more from Jesus, more with Jesus, more like Jesus and more for Jesus! A task that God seems to have given this church, is to reach out to people and places that are not usually touched by the church of God. We thank God for this task. The great mixture of people from totally different social status, from different cultures and backgrounds make the church very "rich". Probably heaven will be a bit similar one day.